The standard Unidisc™ Mk2 is for making 3mm discs from samples 0.10 to 0.15mm thick i.e. the optimum for electro-polishing. If the thickness of the sample is outside the 0.10 to 0.15mm range the same punch is used but the die has to be changed because a different clearance between the punch and the die is required to make good flat discs without any flash around the edges. Discs can be made from materials up to and including 1mm thick stainless steel. To order non-standard 3mm dies quote: the source material and thickness. 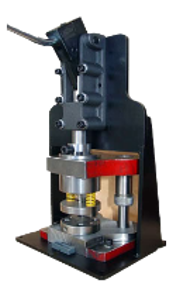 Punch and die sets and/or individual punches and dies can be supplied for producing discs in the range 1 to 6mm in diameter. To obtain advice on the feasibility of your project quote: the diameter of the disc required, the thickness and type of the source material.